Heather Satterley is founder of Satterley Training & Consulting, LLC - a firm dedicated to helping accounting professionals learn and implement QuickBooks and related applications. She works with sole practitioners and teams to streamline internal processes as well as consulting on a variety of client engagements. With over 20 years experience as a bookkeeper, accountant and enrolled agent, Heather has helped thousands of small business owners and accounting professionals sharpen their skills and increase their confidence with accounting technology. As a member of the Intuit Trainer/Writer network, Heather teaches QuickBooks to accounting professionals all over the country via live training events, webinars, and conferences. It takes many things to start and run a successful small business: passion, determination, discipline, and the right people, but the best-laid plans will go nowhere without one key ingredient—cash. The way you manage your cash flow can make or break your business and affect your ability to grow. So knowing how to calculate cash flow at any given time is an important skill for all small business owners. Small businesses need an easy formula to help them analyze how they use cash and project how much cash they’re going to need to grow their business and meet their future obligations. Knowing how to calculate cash flow is and will be a real lifesaver for your business down the road. How you do this is easier than it might seem. The first step is to know the most important cash flow reports: the statement of cash flows and the cash flow forecast. Here are easy cash flow formulas you can follow to calculate each. Let’s explore what each of these mean. It’s certainly tough to see this as a business owner. But, the answer really comes down to the fact that cash flow isn’t profit. Cash flow is simply the movement of money in and out of a business. But many business owners find themselves asking this question because, although they’re familiar with their profit and loss and balance sheet statements, fewer know how to calculate cash flow and, therefore, do not review their cash flow statement regularly. That hopefully will change for you starting today. As cash flow is what drives your business, you should know where it stands at all times. To do this, the first thing you need to know is that the cash flow formula used in a cash flow statement uses information from both the P&L and balance sheet to show the sources of cash inflows and outflows during a specific period. This information is exactly what you need to solve the “where is my money going” dilemma. Operating activities: Cash generated or used to run the day-to-day operations of your business. Investing activities: Cash used for investing in assets like securities, bonds, equipment, or other fixed assets and cash generated from the sale of these types of assets. Financing activities: Cash generated from loan or capital contributions by owners and payments made to reduce loan balances or pay distributions or dividends to the shareholders or owners. The statement of cash flows provides really great insight into how a business is managing its money. It helps you get an even clearer idea of what types of activities are contributing to the cash inflows and outflows. In case you haven’t figured it out yet, this is why you should know how to prepare a cash flow statement and be referencing it often. Company A has $125,000 of profit for the year but only $5,000 in the bank at the end of the year. But how can this be? Let’s take a look at a rough outline of how to calculate cash flow by looking at their cash flow statement to see what’s going on. 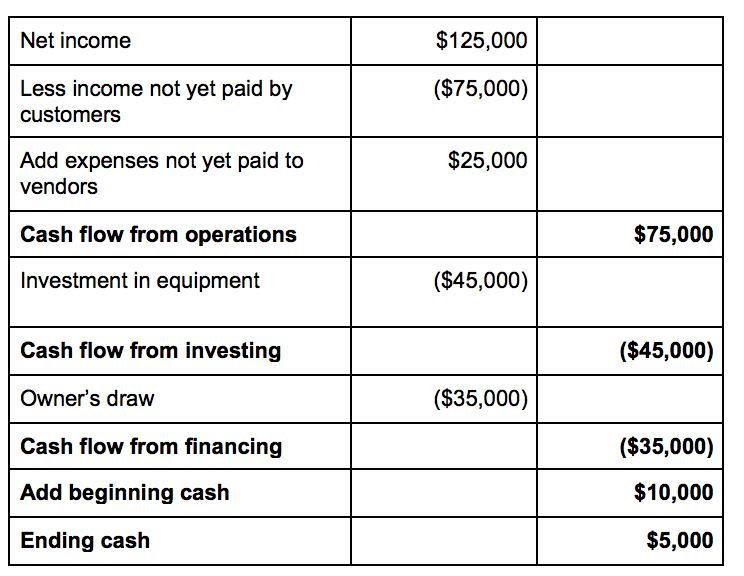 This example illustrates why it’s so important to review the profit and loss, balance sheet, and the statement of cash flows in order to get the full picture of a company’s finances. While Company A was profitable, they still had $75,000 uncollected from their customers and owed vendors $25,000 at the end of the year. These non-cash transactions results in a cash basis income of only $75,000 for the period. They also used $45,000 to purchase new equipment, and the owner took out $35,000 as a draw from the company, which left only $5,000 in the bank at the end of the year. As you can see, profit doesn’t give the full picture of what is happening in a business. But, knowing how to prepare a cash flow statement and doing it often certainly will. 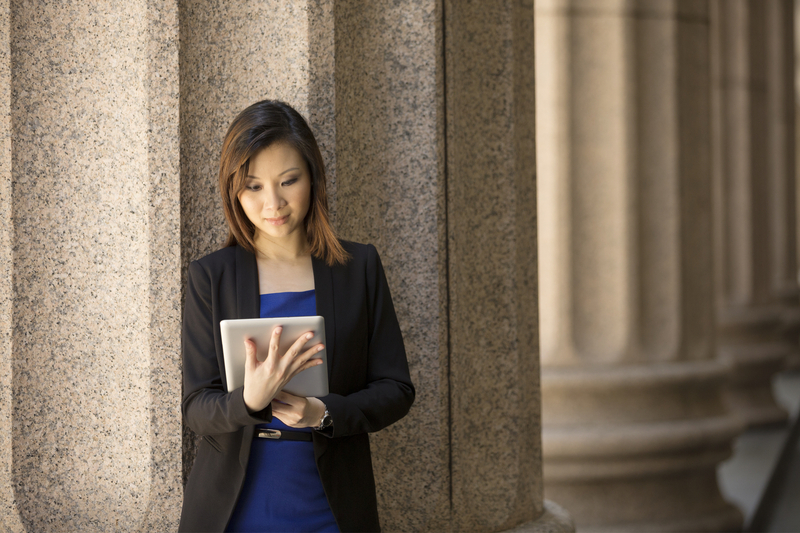 It never hurts to be over-prepared and over-aware when it comes to your business’s finances. Another cash flow formula that you need to use often is a cash flow forecast. This will help your business predict what your cash balance will be in the future. This report can help you determine whether your business will be able to meet its financial obligations by taking into account the current cash balance and adding or subtracting expected future cash inflows and outflows. It’s a great cash flow financial calculator in that it’s forward-leaning and can help your make decisions for the future, like indicating whether it’s a good time to consider making an investment or to seek funding from business loans, cash flow loans, sales of property, or investors. Start with your current cash balance and add the amount of cash you expect to receive during the forecast period. This could be cash from customers, loan proceeds, or cash from investors. Then, deduct your expected cash outflows for the period including things such as unpaid bills to vendors, loan payments, payroll, and other fixed expenses that must be paid during the period. A cash flow forecast is typically reported by a specific period such as week, month, or quarter. It seems pretty simple, but let’s look at an example to make sure it is clear. In week 2, the cash balance is expected to fall below the $15,000 minimum balance required by the bank, so perhaps the owner can defer his $1,000 draw until week 3 when there is a surplus of cash. The ending balance at the end of week 6 is $33,915, which is only $18,915 more than the required minimum balance and doesn’t leave enough cash to purchase the equipment. 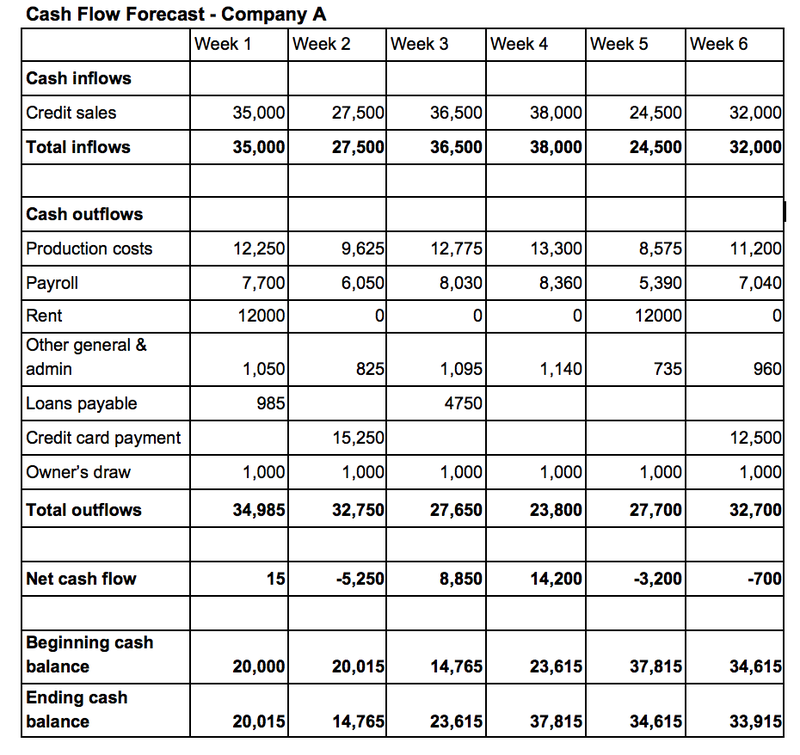 By knowing how to calculate cash flow and preparing the cash flow forecast, Company A determines that in order to purchase the machine during the next six weeks, they need to seek outside financing for at least part of the purchase so they can maintain their minimum required balance and be able to meet their other financial obligations. As you can see, a cash flow formula like the one used in a cash flow forecast can be essential in helping you make day-to-day decisions for your business. It can help you plan when to spend money, and be much more deliberate with where and when your money goes. There are lots of resources available to help businesses manage their cash flow, as it is such an essential part of running a business. The best place to start when you want to look at cash flow formulas are the many accounting programs out there, such as QuickBooks, that have built in tools to help you create a statement of cash flows or cash flow forecast. The answer on how to calculate cash flow can really be as simple as having a great accounting software. You can also find many articles, calculators, and templates to help you create a cash flow statement or a cash flow forecast on the U.S. Small Business Administration’s website, and you can also visit the SCORE website to read articles and find a mentor to help you with your cash flow analysis. Whenever you’re seeking advice on how to calculate cash flow, be sure to verify who the source is. There are many wonderful accountants and bookkeepers out there who can help with this, so that is most likely your best option. Starting today, we hope you make a commitment to start thinking about these cash flow formulas more. Commit to referencing a cash flow statement and forecast often to help as you tackle financial decisions and to keep up with your business’s overall financial health.